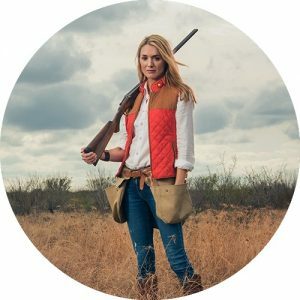 Lifelong outdoorswoman, Adrian Sabom, grew up on a working cattle ranch in South Texas. Her parents, passionate land stewards and avid quail hunters, raised her to respect and protect the beauty of wild things. Taking a page from her folks’ “parenting handbook”, Adrian exposes her two kids to rich outdoor experiences. When they were little we would take them somewhere where you could go our and just romp around. And then we would take them to South Texas as often as we could, and go hunting. Two weeks ago we went down to see my parents and took [the kids] hunting; they love it. You’re out, all day long, and you have such good conversation where you can just talk about whatever. You just don’t get that opportunity that much. Sabom encourages parents to share the gift of wild spaces with their children so that their children will have them enjoy in the future. You know, if we live in San Antonio and we just keep them in the city, that’s what they’re going to know. So, we make sure we take them [outdoors] and do things, so they’re exposed to it, so then they appreciate it. 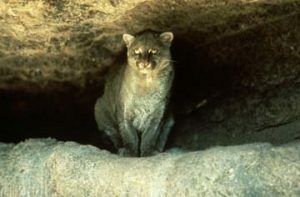 Learn more about connecting with and conserving Texas wild places during Texas Parks and Wildlife Foundation’s We Will not be Tamed campaign. Find details at tpwf.org. By altering his environment… man has also altered habitat…thereby unintentionally speeding the decline of some animal and plant species. We’ve changed a lot of things around. And the fact is that our activities – direct and indirect – determine how much of the wildscape we’re going to have left in the future. Essentially, more humans doing more things, is going to mean less and less of the wild world. Paul Robertson is former head of the Wildlife Diversity Nongame and Rare Species Program. He says when significant declines are noted, waning species end up on the threatened and endangered list. Just short of two hundred animals and plants are listed as threatened or endangered. The number he quoted is for Texas only. Endangered is worse that threatened and threatened is worse than just being stable. Robertson says, in Texas, species stability decreases as human use and misuse of water increases. In Texas the immediate and biggest threat is the human use of water. We’re taking water out of streams; we’re pumping water out of aquifers… All these activities are lowering stream flows…drying up springs. So this, at the present time, is the biggest conflict between humans and native species. The Wildlife Restoration program supports our series. 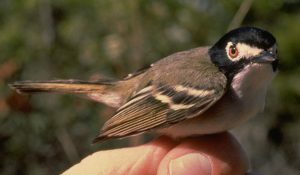 This black-capped vireo male is a passerine species. Think of birding as an opportunity to increase your vocabulary. Take the word passerine, for example. Passerine comes from the Latin, passeriformes—the order of all the songbirds. Cliff Shackelford is a bird nerd. I mean, an ornithologist. Passerine is basically a songbird; it’s our perching birds. And that order includes a big flock of feathered friends. At least half of the species of birds on the planet belong in this one order of birds. They’re characterized by several things, but the one thing on their feet that’s unique is they have three toes pointed forward and one pointed backwards. A new word and bird trivia, too? Does it get any better? Not every bird has that toe configuration. Woodpeckers, for example, have two forward and two back; that allows them to cling to a tree. Some birds have all four digits facing forward, like swifts. Some of the birds that cling to cliff walls and things. And, actually, there is a technical word for passerine’s toe configuration, and it’s called: anisodactyl. Where else are you going to learn two bird nerd words and avian tootsie trivia? Now go out and impress your friends with your new knowledge. The Wildlife and Sportfish Restoration program supports our series. 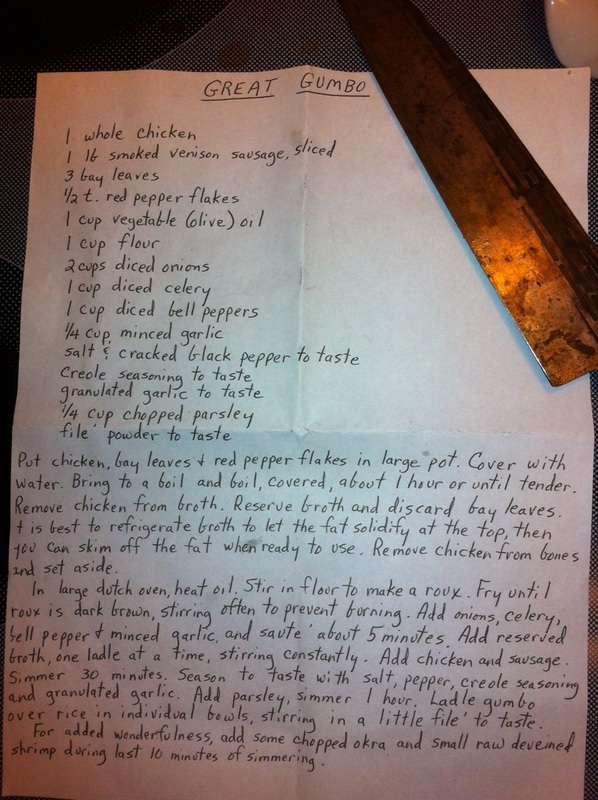 Andy’s Mother in Law’s Gumbo Recipe; just substitute rabbit. Andy Gluesenkamp calls rabbit the third white meat. Rabbit really is all white meat; it’s like a cross between pork and chicken. It’s very, very lean; there’s very little fat in the meat, itself. Director of Conservation at the San Antonio Zoo, Andy has hunted and eaten rabbit since he was a boy. I grew up eating curried rabbit that my mom made. And no one makes better curried rabbit than my mom. A self-professed “good cook,” Andy likes to prepare rabbit he’s harvested. Preparation, he says, begins with properly field dressing the animal, which, he adds, is “easy to clean.” Rabbit is a versatile and healthy protein that lends itself to a variety of cooking styles. I think my buttermilk fried rabbit is pretty good. I also make rabbit gumbo, based on my mother-in-law’s gumbo recipe; and that is exceptional. I’ve also done rabbit pot pie, and Teriyaki rabbit, and grilled rabbit, and poached rabbit. It’s really hard to mess up rabbit. If you don’t hunt rabbits, yourself, make friends with a hunter who does. Barring that, you may find recipe ready rabbits at farmers markets or at your local specialty grocer. Expect success nearly every outing when rabbit hunting—especially when you hunt around the edges. [Those are] Areas where people aren’t necessarily going to be conducting other activities. 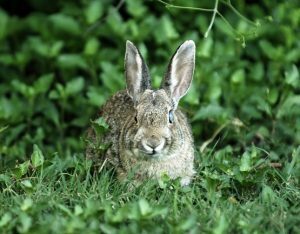 Andy Gluesenkamp, Director of Conservation at San Antonio Zoo, and an avid rabbit hunter, says hunting rabbits provides a “walk in the woods” experience. But what about those edges? You would look for fence lines along fallow fields, or old pasture, or berry patches and cactus patches….So, there’s less competition with other land use – like cattle grazing. Rabbit hunting usually won’t disturb cattle. Or, you’re not going to be competing with deer hunters who are going to be in another kind of habitat. Ask landowners about hunting their property, or consider hunting on TPW’s public lands. Hunt rabbits year-round; however, the cooler months have their advantages. It’s pleasant – getting back to that walking in the woods experience – also in summertime when it’s really dry, they can be a lot leaner. I prefer to eat them when they have a little bit of fat on them. If there’s green grass on the ground – that’s the perfect time to go rabbit hunting. Rabbit as a tasty treat. That’s tomorrow. You are currently browsing the Passport to Texas weblog archives for April, 2018.